`An inch in the right direction is better than a mile in the wrong direction' `If you think your life is bland, then you haven't added enough flavour' `People who live in glass houses should never undress' In September 2009, London cabbie Mark Solomon began asking passengers in the back of his taxi for a random quote or proverb. It started spontaneously, to give him more purpose and direction, but he found that sharing these daily inspirations with others made them feel part of something special too. 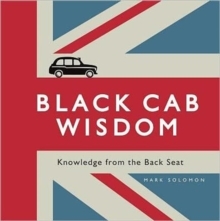 The project developed into a popular website (www.blackcabquotes.com), and now this pocket-sized book offers the best thoughts for the day, ranging from the truly philosophical to the downright bizarre.